1 The applicant, Netherlands Maritime Technology Association, formerly Scheepsbouw Nederland, is an association representing the interests of Dutch shipyards. In 2006 it lodged a complaint, together with other associations, against a Spanish tax scheme promoting the construction of vessels in Spanish shipyards (‘the previous early depreciation scheme’). According to the complainants, that scheme made it possible to secure a rebate of 20-30% on the construction price of a vessel (‘the rebate’). 2 On 29 June 2011 the European Commission initiated the procedure, under Article 108(2) TFEU, against the tax rules on leasing by adopting Decision C(2011) 4494 final (State aid SA.21233 (11/C) (ex NN/11, ex CP 137/06) — Tax regime applicable to certain finance lease agreements also known as the Spanish Tax Lease System) (summarised in OJ 2011 C 276, p. 5) (‘the Opening Decision’). That tax regime concerns a set of rules and arrangements involving, with respect to each order for the construction of a vessel, several parties, namely, a shipping company, a shipyard, a bank, several investors and a leasing company. 3 According to the Opening Decision, the arrangements between the parties mentioned in paragraph 2 above operate as described in the following paragraphs. 4 Initially, the shipping company which intends to purchase a vessel and to take advantage of the rebate agrees with a shipyard on the ship to be built and on a purchase price, namely the net price. This initial contract provides for the payment of regular instalments. 5 However, in order to qualify for the rebate, the company undertakes not to purchase the vessel directly from the shipyard but from an Economic Interest Group (EIG) set up by a bank under Spanish law. 6 The EIG referred to in paragraph 5 above is a transparent tax structure which groups together several investors, who are major taxpayers. Profits and losses made by the EIG are apportioned among its members on a pro rata basis according to their holdings. 7 Secondly, the bank introduces a leasing company which signs a contract for the purchase of the vessel from the shipyard at a gross price. This contract replaces the initial contract. The leasing company then leases the vessel to the EIG, which enables its investor members to deduct the instalments paid to the leasing company from their tax bases. As regards the regular payments, the leasing contract provides for one extra instalment over and above those stipulated in the initial contract. The amount of this extra instalment constitutes the rebate, which is the difference between the net price set out in the initial contract and the gross price actually paid by the leasing company to the shipyard. 8 At the end of the leasing contract, which is short-term (three to four years), the EIG referred to in paragraph 5 above undertakes to purchase the vessel from the leasing company. That vessel is then resold to the shipping company at the net price, as initially agreed, pursuant to a bareboat charter contract. 10 According to the Opening Decision, the arrangements described in paragraphs 4 to 9 above seek to secure tax advantages within the EIG referred to in paragraph 5 above, advantages which are then apportioned among the parties concerned. 11 First, according to Spanish accounting rules, costs arising from the use of an asset should not be influenced by its method of financing. Accordingly, leased assets may be depreciated in the same way as assets which are otherwise financed. Article 115 of the Real Decreto Legislativo 4/2004, por el que se aprueba el texto refundido de la Ley del Impuesto sobre Sociedades (Royal legislative decree 4/2004 approving the coordinated text of the law on corporate taxation) of 5 March 2004 (BOE No 61, of 11 March 2004, p. 10951; ‘the LIS’) deals with the tax treatment of certain leasing transactions. 12 Article 115(6) of the LIS thus permits accelerated depreciation, over three to four years, of payments made under a leasing contract. This provision makes it possible to depreciate a vessel for tax purposes faster than its real wear and tear. Furthermore, Article 115(11) of the LIS enables the depreciation to be brought forward so that it starts before the asset becomes operational, that is as soon as construction begins. This possibility of early depreciation, which is available to EIGs under certain conditions pursuant to Article 48(4) of the LIS, is subject to prior authorisation from the Spanish Ministry for Economic Affairs and Finance. The authorisation procedure is governed by Article 49 of Real Decreto 1777/2004, por el que se aprueba el Reglamento del Impuesto sobre Sociedades (Royal legislative decree 1777/2004 approving the Regulation on corporate taxation) of 30 July 2004 (BOE No 189, of 6 August 2004, p. 37072; ‘the RIS’). 13 Accelerated and early depreciation increases the costs of the EIG referred to in paragraph 5 above and creates losses for it, which the investors can deduct from their tax bases. It also artificially decreases the tax value of the vessel compared to its real value. That capital gain amounts to a hidden liability which, according to the normal rules on corporation tax, is taxable if the vessel is resold. 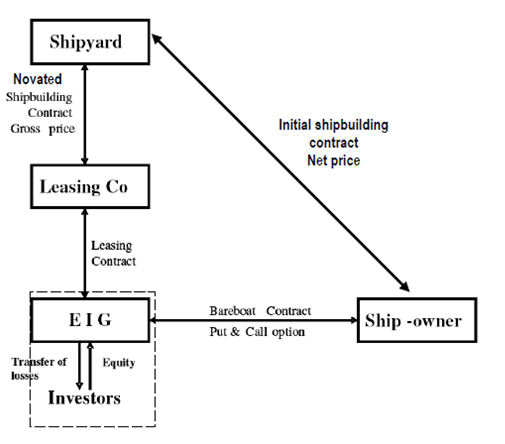 14 Second, before reselling the vessel to the shipping company pursuant to the bareboat charter contract, the EIG referred to in paragraph 5 above applies for authorisation from the tax authorities to opt out of the normal corporation tax system and opt into the tonnage tax system provided for in Articles 124 and 128 of the LIS. That system provides for the taxation of activities related to shipping based on the tonnage of vessels. It replaces normal corporation tax. Article 125(2) of the LIS governs the taxation of capital gains made when a vessel is resold. For that purpose, it provides for the taxation of capital gains made on the sale of vessels which are subject to the tonnage tax system, where those gains are the result of an over-depreciation carried out before those vessels entered that system. 15 However, the effect of Article 50(3) of the RIS is that the ring fence rule laid down in Article 125(2) of the LIS does not apply if the vessel was purchased under a leasing contract approved beforehand by the tax authorities on the basis of Article 115(11) of the LIS. Such a vessel is considered to be new, irrespective of whether it has already been used or whether it has already been depreciated. Switching to the tonnage tax system therefore enables the EIG referred to in paragraph 5 above to avoid taxation on the capital gain of the over-depreciated vessel. 16 Together, those provisions place the EIG referred to in paragraph 5 above in a position to, on the one hand, create losses which its member investors can deduct from their tax bases and, on the other, to avoid taxation on the capital gain of the over-depreciated vessel. The combination of these effects makes it possible to secure a tax gain corresponding to approximately 30% of the gross price paid by the leasing company to the shipyard. That gain is then apportioned among the investors in the EIG (10-15%) and the shipping company (85-90%). 17 The Commission considered that the advantages flowing from the previous early depreciation scheme constituted State aid within the meaning of Article 107(1) TFEU in favour of all the parties involved in the vessel leasing scheme (see paragraph 2 above). The Commission observed that the system was used almost exclusively in transactions involving shipping companies purchasing vessels from Spanish shipyards. All those transactions also involved leasing companies and wealthy Spanish taxpayers grouped together in EIGs such as those referred to in paragraph 5 above under the aegis of structures put in place by Spanish banks. The Commission considered, inter alia, that the early depreciation scheme provided for in Article 115(11) of the LIS contained an element of selectivity, since it required an authorisation from the tax authority covering all the effects of the leasing contract. 18 The Commission added that it approved the tonnage tax system in Decision C(2002) 582 of 27 February 2002. However, it noted that Article 50(3) of the RIS, which enables the effects of the ring fence rule in Article 125(2) of the LIS to be nullified, was not notified to the Commission and, as such, was not approved by it. 19 By letter of 29 May 2012, registered by the Commission on 30 May 2012, the Kingdom of Spain gave notification to the Commission of an amended version of Article 115(11) of the LIS. 20 In response to the Commission’s requests for information, the Kingdom of Spain provided additional information on 6 June and 22 August 2012. After a meeting between the Commission and the Kingdom of Spain on 4 September 2012, the latter submitted an amended version of the notified measure on 24 September 2012, and additional information requested by the Commission on 26 September and 5 October 2012. 21 During the examination conducted by the Commission, the applicant wrote to the Commission on 6 July, 24 and 27 August and 20 November 2012 requesting information on the progress of the examination of the notified measure and submitting that third parties should be given the opportunity to comment on the notified measure. 22 By its Decision of 20 November 2012 relating to State aid SA 34736 (12/N) concerning the implementation by the Kingdom of Spain of a tax scheme permitting the early depreciation of certain assets acquired through financial leasing (‘the contested decision’), the Commission found that the notified measure did not constitute State aid within the meaning of Article 107(1) TFEU and was therefore compatible with the internal market. 24 According to the contested decision, the application of that new provision is optional and no longer requires prior authorisation. Mere notification to the tax authorities is sufficient. 25 Further, the Spanish authorities confirmed that the new version of Article 15(11) of the LIS required no implementing measure, and consequently the conditions for application laid down by Article 48(4) of the LIS and Article 49 of the RIS were no longer relevant and would be repealed. 26 The Spanish authorities also confirmed that Article 50(3) of the RIS would be repealed, and consequently the ring fence measure laid down in Article 125(2) of the LIS would henceforth apply to the capital gain realised on the transfer of over‑depreciated vessels from the normal tax system to the tonnage tax system. 27 In paragraphs 24 to 36 of the contested decision, the Commission analysed whether the notified measure was such as to favour certain undertakings or certain sectors of activity for the purposes of Article 107(1) TFEU. 28 The Commission noted, first, that the measure was applicable to all the companies which are subject to income tax in Spain without distinction according to sectors of activity, places of establishment, size or legal status. The fact that the measure applied only to assets acquired through a leasing contract did not give rise to a selective advantage, as all kinds of assets can be financed through leasing contracts, which can be used by companies of all sizes operating in all sectors of activity. The Commission also noted that, according to the Spanish authorities, the notified measure applied both to assets built in Spain and those built in other Member States. 29 Next, although the notified measure makes the possibility of early depreciation subject to several conditions and although it excludes mass-produced assets, the Commission considered that those restrictions were aimed at limiting the possibility of early depreciation to cases where the lessee is required to pre-finance the asset and therefore bear the financial cost of the asset before it becomes operational. Those restrictions were therefore justified by reason of the nature and internal logic of the Spanish tax system. 30 Last, the Commission observed that the conditions imposed by the notified measure were sufficiently precise and objective so as to preclude a discretionary or discriminatory application by the tax authorities. In addition, the application of the new measure was not subject to prior authorisation from the tax authorities. 31 The Commission therefore concluded that the notified measure did not constitute State aid within the meaning of Article 107(1) TFEU. 32 By application lodged at the Court’s Registry on 8 March 2013, the applicant brought this action. 33 As measures of organisation of procedure provided for in Article 64 of its Rules of Procedure, the Court, by letters of 21 May 2013, sent questions in writing to the applicant and the Commission requesting a response within their reply and rejoinder, respectively. The applicant and the Commission complied with the request within the period prescribed. 34 By document lodged at the Court’s Registry on 28 June 2013, the Kingdom of Spain sought leave to intervene in support of the Commission. 35 By order of the President of the Fourth Chamber of 4 September 2013, leave to intervene was granted. 36 The Kingdom of Spain lodged its statement in intervention on 13 November 2013. On 10 and 16 January 2014 respectively, the applicant and the Commission submitted their observations on the statements in intervention. 37 Following a change in the composition of the Chambers of the Court, the Judge‑Rapporteur was assigned to the Seventh Chamber, to which the present case was accordingly allocated. 38 On hearing the report of the Judge-Rapporteur, the Court decided to open the oral procedure and, by way of measures of organisation of procedure pursuant to Article 64 of its Rules of Procedure, requested the Commission to produce certain documents. The Commission responded to that request within the prescribed period. 39 The parties presented oral arguments and answered the questions put to them by the Court at the hearing on 10 July 2014. 43 In support of the action, the applicant relies on a single plea in law, claiming an infringement of Article 108(3) TFEU and Article 4(2) and (3) of Council Regulation (EC) No 659/1999 of 22 March 1999 laying down detailed rules for the application of Article [108 TFEU]. According to the applicant, the examination of the notified measure by the Commission raised serious difficulties which made it essential that the formal investigation procedure under Article 4(4) of that regulation be initiated. The applicant claims that the existence of serious difficulties is revealed by evidence of, first, the circumstances and length of the preliminary procedure and, second, the fact that the examination carried out by the Commission was insufficient and incomplete. 44 According to settled case-law, where the Commission is unable to reach the firm view, following an initial examination in the context of the procedure under Article 108(3) TFEU, that a State aid measure either is not ‘aid’ within the meaning of Article 107(1) TFEU or, if classified as aid, is compatible with the Treaty, or where that procedure has not enabled the Commission to overcome all the difficulties involved in assessing the compatibility of the measure under consideration, the Commission is under a duty to initiate the procedure under Article 108(2) TFEU, without having any discretion in that regard. That duty is, moreover, expressly confirmed by the provisions of Article 4(4), in conjunction with Article 13(1), of Regulation No 659/1999 (judgment of 22 December 2008 in British Aggregates v Commission, C‑487/06 P, ECR, EU:C:2008:757, paragraph 113). 45 In that regard, and in accordance with the case-law, the concept of serious difficulties is an objective one. The existence of such difficulties must be sought both in the circumstances in which the contested measure was adopted and in its content, in an objective manner, comparing the grounds of the decision with the information available to the Commission when it took a decision on the compatibility of the disputed aid with the common market (see the judgment of 28 March 2012 in Ryanair v Commission, T‑123/09, ECR, EU:T:2012:164, paragraph 77 and case-law cited). It follows that the review of lawfulness to be carried out by the Court on the existence of serious difficulties, by its nature, cannot be confined to consideration of whether or not there has been a manifest error of assessment (the judgment of 27 September 2011 in 3F v Commission, T‑30/03 RENV, ECR, EU:T:2011:534, paragraph 55). A decision adopted by the Commission without initiating the formal investigation procedure can be annulled on that ground alone, because of the failure to initiate the inter partes and detailed examination laid down in the FEU Treaty, even if it has not been established that the Commission’s assessments as to substance are wrong in law or in fact (see, to that effect, the judgment of 9 September 2010 in British Aggregates and Others v Commission, T‑359/04, ECR, EU:T:2010:366, paragraph 58). 46 The applicant bears the burden of proving the existence of serious difficulties and may discharge that burden of proof by reference to a body of consistent evidence, concerning, first, the circumstances and the length of the preliminary examination procedure and, secondly, the content of the contested decision (the judgment of 3 March 2010 in Bundesverband deutscher Banken v Commission, T‑36/06, ECR, EU:T:2010:61, paragraph 127). 47 Although the Commission has no discretion in relation to the decision to initiate the formal investigation procedure, where it finds that such difficulties exist, it nevertheless enjoys a certain margin of discretion in identifying and evaluating the circumstances of the case in order to determine whether or not they present serious difficulties. In accordance with the objective of Article 108(3) TFEU and its duty of good administration, the Commission may, amongst other things, engage in dialogue with the notifying State or with third parties in an endeavour to overcome, during the preliminary examination procedure, any difficulties encountered (the judgments of 15 March 2001 in Prayon-Rupel v Commission, T‑73/98, ECR, EU:T:2001:94, paragraph 45, and in Bundesverband deutscher Banken v Commission, EU:T:2010:61, paragraph 126). That power presupposes that the Commission may adjust its position according to the results of the dialogue entered into, without that adjustment having to be interpreted, a priori, as establishing the existence of serious difficulties (the judgment of 12 December 2006 in Asociación de Estaciones de Servicio de Madrid and Federación Catalana de Estaciones de Servicio v Commission, T‑95/03, ECR, EU:T:2006:385, paragraph 139). 48 According to the case-law, the fact that the time spent considerably exceeds the time usually required for a preliminary examination under Article 108(3) TFEU may, with other factors, justify the conclusion that the Commission encountered serious difficulties of assessment necessitating the initiation of the procedure under Article 108(2) TFEU (the judgments of 20 March 1984 in Germany v Commission, 84/82, ECR, EU:C:1984:117, paragraphs 15 and 17; of 10 May 2000 in SIC v Commission, T‑46/97, ECR, EU:T:2000:123, paragraph 102; and of 10 February 2009 in Deutsche Post and DHL International v Commission, T‑388/03, ECR, EU:T:2009:30, paragraph 94). 49 It is also apparent from the case-law that if the examination carried out by the Commission during the preliminary examination procedure is insufficient or incomplete, this constitutes evidence of the existence of serious difficulties (see the judgment in Bundesverband deutscher Banken v Commission, EU:T:2010:61, paragraph 57 and case-law cited). 50 The applicant claims that the circumstances and length of the preliminary examination of the notified measure constitute probative evidence of the existence of serious difficulties in the assessment of the notified measure. 51 First, the applicant states that the notified measure is designed to replace the previous early depreciation scheme, which was being closely investigated at the time of notification. According to the applicant, the notified measure is designed to maintain aid to Spanish shipyards and to address the risk that the previous early depreciation scheme might be prohibited by the Commission. Given the objective pursued by the Spanish government, the Commission should have exercised particular care in relation to the notified measure and should have initiated the formal investigation procedure. 52 According to the applicant, the objective pursued by the notified measure is obvious from its description in the contested decision and the many characteristics it shares with the previous early depreciation scheme. The Commission should therefore have taken into account its doubts concerning the previous early depreciation scheme in its analysis of the notified measure. In particular, the Commission should have identified the potential beneficiaries of the notified measure in order to determine whether or not a selective advantage was conferred on them. 53 The Commission, supported by the Kingdom of Spain, considers that the applicant’s arguments are unfounded. 54 It is appropriate to recall the settled case-law according to which Article 107 TFEU does not distinguish between measures of State intervention by reference to their causes or their aims but defines them by their effects (judgment of 2 July 1974 in Italy v Commission, 173/73, ECR, EU:C:1974:71, paragraph 27; see the judgment of 15 November 2011 in Commission and Spain v Government of Gibraltar and United Kingdom, C‑106/09 P and C‑107/09 P, ECR, EU:C:2011:732, paragraph 87 and case-law cited). Consequently, the Commission’s analysis of the notified measure did not have to refer to the presumed objective of the measure, as claimed by the applicant, but solely to its potential effects. 55 Further, since the Commission was actively involved in the assessment of the previous early depreciation scheme, the Commission was well placed to determine whether or not the notified measure was likely to produce the same effects as those identified in relation to the previous scheme. Contrary to what is claimed by the applicant, the Commission devoted particular attention to that point. Paragraphs 16 to 23 of the contested decision not only describe the characteristics of the notified measure, but also explain how that measure differed from the previous scheme. The content of the questions sent to the Spanish authorities by the Commission in its requests for information dated 29 May, 1 August and 3 October 2012 also demonstrate that the Commission did check that the notified measure did not raise the same problems as those identified in the Opening Decision. 56 Second, the applicant claims that it wrote on numerous occasions to the Commission to inform the latter that the introduction of the notified measure raised serious concerns for shipyards across Europe and to request the opportunity to be heard in a formal investigation procedure. Further, the applicant states that, according to the case-law, the lodging of a complaint by a third party is an indication that serious doubts about the compatibility of a measure exist, particularly where the complaint is supported by cogent evidence, as in this case. The applicant also states that requirements of procedural economy cannot take precedence over the procedural rights of the parties concerned, those rights being fundamental rights, protected by the Charter of Fundamental Rights of the European Union. 57 The Commission, supported by the Kingdom of Spain, considers that the applicant’s arguments are unfounded. 58 It must be observed that, even though complaints submitted by third parties may constitute indications of the existence of serious difficulties, their relevance very much depends on the evidence contained in those complaints and not on the mere fact that observations have been submitted (the judgments of 3 May 2001 in Portugal v Commission, C‑204/97, ECR, EU:C:2001:233, paragraphs 35 to 40, and of 20 September 2007 in Fachvereinigung Mineralfaserindustrie v Commission, T‑375/03, EU:T:2007:293, paragraphs 127 to 129). 59 In this case, the applicant certainly sent a number of letters and emails to the Commission. It is however clear that, by that correspondence, the applicant requested information on the progress of the examination of the notified measure and made known its concerns as to the potentially anti-competitive effect of that measure. The applicant also demanded the initiation of the formal investigation procedure in order to enable the interested parties to comment on the measure. However, that correspondence did not provide any additional information or assessments in relation to the notified measure. The applicant therefore did not submit any material capable of giving rise to serious difficulties. 60 Further, the Commission is correct in observing that the mere lodging of a complaint or of observations by a third party cannot constitute an indication of the existence of serious difficulties in the assessment of a notified measure. If that was the case, the mere filing of a complaint by a third party would be sufficient to compel the Commission to initiate the in-depth examination procedure. Such a situation would be likely not only to give rise to abuses of the system for reviewing State aid, but would be incompatible with the purpose of that system, which primarily rests on dialogue between the Commission and the Member States and in which third parties have only a limited role to play (see, to that effect, the judgments of 2 April 1998 in Commission v Sytraval and Brink’s France, C‑367/95 P, ECR, EU:C:1998:154, paragraph 59, and of 24 September 2002 in Falck and Acciaierie di Bolzano v Commission, C‑74/00 P and C‑75/00 P, ECR, EU:C:2002:524, paragraphs 80 to 82). The applicant’s reference to the Charter of Fundamental Rights does not alter that finding. The Charter is not intended to alter the nature of the review of State aid established by the FEU Treaty or to confer on third parties a right of scrutiny which Article 108 TFEU does not provide (see, to that effect, the judgment of 30 April 2014 in Tisza Erőmű v Commission, T‑468/08, ECR, EU:T:2014:235, paragraphs 204 to 207). 61 Third, the applicant states that the long duration of the preliminary examination is indicative of the difficulties encountered by the Commission. Whereas Article 4(5) of Regulation No 659/1999 provides for a period of two months for such an examination, the period of examination of the notified measure was six months. To that period of six months there has to be added a long pre-notification phase, which, according to the Spanish press, began more than nine months before the formal notification. Such a long pre-notification phase is, according to the applicant, evidence of complications, having regard to, inter alia, the Code of Best Practice for the conduct of State aid control procedures (OJ 2009 C 136, p. 13; ‘the Code of Best Practice’), which, in paragraph 14 thereof, permits a pre-notification phase of several months only in complex cases. 62 The applicant also claims that the Commission cannot extend the duration of the pre-notification phase and the preliminary examination in order to avoid initiating the formal investigation procedure in cases where there are doubts as to the compatibility of a measure. Such conduct would exclude interested parties and would be contrary to their procedural rights as guaranteed by the Charter of Fundamental Rights and the principles of good administration. In that regard, the applicant states that a representative of the Commission gave an evasive answer in January 2012 to questions submitted by a member of the European Parliament who wanted to know whether the Spanish authorities had adopted a new early depreciation scheme. 63 The Commission, supported by the Kingdom of Spain, considers that the applicant’s arguments are unfounded. 64 In that regard, it must be recalled that, under Article 4(5) of Regulation No 659/1999, the Commission’s decisions after a preliminary examination are to be taken within two months, that period beginning on the day following the date of receipt of the complete notification. Therefore, when the preliminary examination is triggered by a notification from a Member State, the Commission is bound to comply with the time-limit imposed by that regulation. However, Article 4(5) of the regulation allows the extension of the period with the consent of both the Commission and the Member State concerned. It follows that the period of two months laid down in that provision is designed mainly to protect the interests of the notifying Member States and not the interests of third parties. 65 In this case, the Commission took almost six months after the notification of 30 May 2012 to adopt the contested decision, on 20 November 2012. That period therefore exceeds the period within which the Commission is, in principle, required to complete its preliminary examination. 66 However, while a period of examination of that length does exceed what is normally involved in an initial examination carried out under the provisions of Article 108(3) TFEU, it can only constitute an indication of the existence of serious difficulties if it is supported by other factors (see, to that effect, the judgments in Asociación de Estaciones de Servicio de Madrid and Federación Catalana de Estaciones de Servicio v Commission, EU:T:2006:385, paragraph 135 and case-law cited, and Deutsche Post and DHL International v Commission, EU:T:2009:30, paragraphs 98 and 106). 67 It is necessary therefore to examine whether there are factors, other than the fact that the time-limit of two months laid down by Article 4(5) of Regulation No 659/1999 was exceeded, which tend to demonstrate the existence of serious difficulties. In that regard, the applicant refers in particular to the length of the pre-notification phase. 68 The Commission considers that the pre-notification phase was very brief, to the extent that it began on the date of receipt of the draft notified measure sent by the Kingdom of Spain on 22 May 2012. In that regard, it is plain that, given that notification took place on 30 May 2012, the pre-notification phase was indeed very brief. 69 Even if the view were to be taken that, as the applicant claims, the pre-notification phase lasted nine months and consequently exceeded the duration suggested in the Code of Best Practice, it would have to be stated that that period is not mandatory, as is clear from paragraphs 5 and 8 of that code. Above all, the reason why such a duration does not appear excessive is the lack of clarity as regards the content of the measure which the Kingdom of Spain wanted to notify. It is clear from the answers given by the Commission to the Court’s questions that the Kingdom of Spain submitted to it three different proposals, namely a first proposal in May 2011, a second in November 2011 and the final version in the week preceding the notification of 30 May 2012. The time that the Commission had to devote to the study of those drafts of May and November 2011, which were ultimately not notified, cannot therefore be indicative of serious difficulties experienced by the Commission in the adoption of the decision relating to the text which was ultimately notified, since the content of those drafts differed from that of the notified measure. 70 Last, to the extent that the content of the May and November 2011 drafts differed from that of the draft which was in fact notified on 30 May 2012, it also follows that the time spent by the Commission in studying those earlier drafts again does not support the applicant’s argument that the Commission sought to prolong the length of the pre-notification phase in order to avoid initiation of the formal investigation procedure. 71 Fourth, the applicant argues that other items of evidence linked to the degree of contact between the Commission and the Kingdom of Spain also demonstrate that the examination of the notified measure in the pre-notification phase and during the preliminary examination was difficult. Articles in the Spanish press stated that the pre-notification phase needed not less than five drafts of the notification, several meetings and discussions involving the Commissioner for Competition and a Spanish Minister. The number of meetings and the number of detailed information requests sent to the Spanish authorities during the preliminary examination are greater than the number of contacts envisaged in the Code of Best Practice. According to the applicant, while contact between the Commission and a Member State does not demonstrate in itself that there are serious difficulties, it can none the less constitute, in conjunction with other factors, such as the duration and intensity of involvement of the parties concerned, a body of evidence which reveals the complexity of the case and the difficulties encountered. The same is true of the negative signals sent by the Commission to the Spanish government, as reported in articles published in the Spanish press. 72 The Commission, supported by the Kingdom of Spain, considers that the applicant’s arguments are unfounded. 73 It must be borne in mind, first, and as stated in paragraph 47 above, that the Commission may engage in dialogue with the notifying State or with third parties in an endeavour to overcome, during the preliminary examination procedure, any difficulties encountered. That power presupposes that the Commission may adjust its position according to the results of the dialogue entered into, without that adjustment having to be interpreted, a priori, as establishing the existence of serious difficulties (the judgment in Asociación de Estaciones de Servicio de Madrid and Federación Catalana de Estaciones de Servicio v Commission, EU:T:2006:385, paragraph 139, and the judgment of 10 July 2012 in TF1 and Others v Commission, T‑520/09, EU:T:2012:352, paragraphs 76 and 77). Consequently, the mere fact that discussions took place between the Commission and the Member State concerned during the preliminary examination stage and that, in that context, the Commission asked for additional information about the measures submitted for its review cannot in itself be regarded as evidence that the Commission was confronted with serious difficulties of assessment (judgment in 3F v Commission, EU:T:2011:534, paragraph 71). 74 It is however conceivable that the content of the discussions between the Commission and the Member State concerned during that stage of the procedure might, in certain circumstances, be capable of revealing the existence of such difficulties (see the judgment in TF1 and Others v Commission, EU:T:2012:352, paragraphs 76 and 77 and case-law cited). Moreover, the sending of a high number of requests for information to the Spanish authorities by the Commission may, in association with the length of the preliminary examination, constitute an indication of serious difficulties (the judgment in Deutsche Post and DHL International v Commission, EU:T:2009:30, paragraph 99). 75 In this case, the Commission sent a request for additional information on the very day of notification and two other requests during the preliminary examination. Those questions dealt with a variety of subjects, such as the potential selectivity of the notified measure, the procedure to be followed by any entity wanting to use the early depreciation provided for by the notified measure, the application of the tonnage taxation scheme to the EIGs and the existence of provisions connected to the notified measure. It is therefore clear that not only was the number of requests for information not very high, taking into consideration, inter alia, the technical nature of the matters to be dealt with (see, to that effect, the judgment in TF1 and Others v Commission, EU:T:2012:352, paragraph 78), but also that those requests concerned a limited number of questions of detail relating to the notified measure. Further, even though there were five meetings of the Commission and the Spanish authorities during the pre-notification phase, with the last such meeting taking place three months before notification, the two parties met on only one occasion after the content of the notified measure had been finalised, namely on 4 September 2012. Those exchanges of views enabled the Spanish authorities to adapt the notified measure in order to overcome any difficulties that might have been encountered by the Commission, as is permissible in accordance with the principles set out in the case-law and referred to in paragraph 73 above. 76 It follows that the circumstances surrounding the progress of the preliminary examination and its length are not sufficient in themselves to indicate the existence of serious difficulties which would have compelled the Commission to initiate the in-depth investigation procedure provided for in Article 108(2) TFEU. 77 In addition, having adopted measures of organisation of procedure under Article 64 of the Rules of Procedure requesting the Commission to provide certain documents relating to its administrative procedure (see paragraph 38 above), the Court considers that it is not necessary in order to rule on this case to adopt other measures of organisation of procedure with the aim of obtaining all the documents requested by the applicant in this action. 78 The applicant claims that the Commission’s examination of the notified measure was insufficient and incomplete and that this constitutes evidence of the existence of serious difficulties. The applicant relies on a number of arguments to that effect. 79 The applicant’s first argument is that the Commission failed to assess the effects of the notified measure in its context. In the contested decision, the Commission confined itself to studying the effects of that measure in isolation, whereas the Opening Decision concerning the previous early depreciation scheme had examined the effects of Article 115(11) of the LIS in conjunction with the effects of other tax and non-tax provisions before coming to the conclusion that all those provisions taken together conferred a selective advantage. Such deficient analysis is also contrary to the settled case-law according to which the assessment of tax measures should not be limited to a single provision but must also take into account other related measures. Further, the notified measure is not directly applicable, since its vague and open wording requires interpretation by the tax authorities before it can be effectively implemented. 80 The Commission, supported by the Kingdom of Spain, argues that the applicant’s first argument is unfounded. 81 It must be observed that the applicant refers to, inter alia, the provisions of the previous early depreciation scheme which were examined in the Opening Decision (see paragraphs 10 to 16 above). Yet, contrary to what is claimed by the applicant, the Commission did indeed examine those provisions, first by summarising them in paragraphs 4 to 15 of the contested decision and then by analysing their relevance to the notified measure in paragraphs 16 to 23 of that decision. The Commission observed therein that, inter alia, a number of provisions which, together with the previous version of Article 115(11) of the LIS, underpinned the operation of the previous early depreciation scheme were repealed or would not apply to the notified measure. 82 The same is true of the repeal of Article 48(4) of the LIS, which, under certain conditions, gave EIGs the possibility of using the early depreciation under Article 115(11) of the LIS and Article 50(3) of the RIS, which enabled EIGs to avoid, in the event of the re-sale of an over-depreciated vessel, the capital gain taxation laid down in Article 125(4) of the LIS. Further, it is apparent from paragraphs 20 and 21 of the contested decision that the Commission assessed whether or not the application of the notified measure required prior authorisation or any implementation measures. The Commission concluded that that was not the case. 83 Given that the previous early depreciation scheme provisions were repealed and that the application of the new version of Article 115(11) of the LIS no longer requires prior authorisation from the tax authorities, the question of the combined effects of the former provisions simply did not arise. 84 The applicant’s second argument is that the Commission failed to give sufficient attention to the question of whether the notified measure conferred a de facto selective advantage. That failure is to be contrasted with the Opening Decision concerning the previous early depreciation scheme, which contains a detailed examination of all the potential beneficiaries of the previous scheme and which identified the existence of a de facto selective advantage. In that regard, the applicant explained at the hearing that the Commission confined itself, when requesting information from the Spanish authorities, to examining the existence of a de jure selective advantage, not whether there was a de facto selective advantage. Since the notified measure is constructed in the same way and concerns the same economic operators as the previous early depreciation scheme, the Commission ought to have analysed whether the Spanish shipyards, the shipping companies, the intermediaries or the EIGs would continue to have the benefit of an advantage. According to the applicant, such an analysis was required for the following reasons. 85 In the first place, both certain articles published in the trade press and in the Spanish press and the Commission’s Press Release on the contested decision convey the impression that the notified measure addressed the concerns of the Spanish shipyards. According to the applicant, the Commission took no account of either those articles or of the concerns of third parties. 86 In the second place, the very specific criteria laid down by Article 115(11) of the LIS as regards qualifying assets implied that the only entities that would benefit would be large specialised entities with substantial resources. According to the applicant, the contested decision failed to examine that de facto advantage. 87 In the third place, the EIGs would continue to have the benefit of certain tax advantages under the tonnage taxation system (see paragraph 14 above). However, as opposed to what the Commission did when examining the previous early depreciation scheme, the Commission did not take account of that factor in its assessment of the notified measure. 88 Further, the applicant maintains that, when assessing tax measures, the Commission must define a reference system which allows for the proper assessment of the selectivity of the advantage granted. 89 The Commission, supported by the Kingdom of Spain, argues that the applicant’s second argument is unfounded. 90 It must be recalled that a measure by which the public authorities grant to certain undertakings an advantageous tax treatment which, although not involving a transfer of State resources, places the beneficiaries in a more favourable financial situation than other taxpayers constitutes State aid within the meaning of Article 107(1) TFEU (see the judgments of 15 March 1994 in Banco Exterior de España, C‑387/92, ECR, EU:C:1994:100, paragraph 14 and case-law cited, and of 8 September 2011 in Paint Graphos and Others, C‑78/08 to C‑80/08, EU:C:2011:550, paragraph 46 and case-law cited). On the other hand, advantages resulting from a general measure applicable without distinction to all economic operators do not constitute State aid within the meaning of Article 107 TFEU (see, to that effect, the judgments of 19 September 2000 in Germany v Commission, C‑156/98, ECR, EU:C:2000:467, paragraph 22, and of 15 June 2006 in Air Liquide Industries Belgium, C‑393/04 and C‑41/05, EU:C:2006:403, paragraph 32 and case-law cited). 91 In this case, it is clear from the Commission’s answers to the Court’s questions, and particularly from the requests for information sent by the Commission to the Spanish authorities, that the Commission, as part of its examination, studied the question of a potential selective advantage conferred by the notified measure. On the basis of that examination, the Commission held, in paragraphs 26 to 36 of the contested decision, that the notified measure was a general measure which did not confer a selective advantage, since that measure applied to all undertakings which are subject to income tax in Spain. The Commission stated that while it is true that the notified measure concerned only assets acquired through a financial leasing contract, that limitation was not selective, because any kind of asset acquired by any kind of company active in any sector of the economy can be the subject of a leasing contract. The Commission added that it was also correct that the notified measure imposed certain conditions, as regards the asset being custom-built and as regards the construction period and pre-financing, and, accordingly, only certain financial leasing contracts could qualify. The Commission none the less considered that those criteria were consistent with the internal logic of the tax system. According to the Commission, the measure serves to offset the fact that a lessee has to bear the financial cost of a significant part of the asset before it actually becomes operational. 92 It follows that the Commission examined the question of whether the notified measure contained an element of selectivity. Further, although that examination is succinct, it cannot be described as insufficient, contrary to what is asserted by the applicant. 93 First, the new version of Article 115(11) of the LIS is self-standing. As stated above, its application no longer depends on provisions of the previous early depreciation scheme, which the Spanish authorities undertook to repeal. The answer to the question of whether the notified measure conferred a selective advantage cannot therefore be dependent on the effect of those previous provisions. It follows that it was no longer necessary to examine the question of whether it might be selective by comparison with the previous early depreciation scheme. 94 Second, as regards the tonnage taxation system, it must be noted that that system was not the subject of the notification and that it had been previously examined and approved by the Commission in 2002 (see paragraph 18 above). There was therefore no need for the Commission to re‑examine it in the context of the notification which led to the contested decision. 95 Third, since the benefit of the early depreciation provided for by the notified measure is available to any kind of undertaking and since the status of the EIGs was not challenged by the Opening Decision, the Commission was also not required to assess further whether or not the notified measure favoured the EIGs and their investors. 96 Fourth, the conditions which must be met, according to the notified measure, by the assets in order that the financial leasing relating thereto can have the benefit of early depreciation, refer to a category of assets which is open and indeterminate and which may include, but is not limited to, vessels. There was therefore no need for the Commission to determine specifically whether the notified measure favours shipyards or shipping companies. In that regard, it must be noted, in addition, that the Commission stated in paragraph 30 of the contested decision that the notified measure applies to assets constructed both in Spain and abroad. 97 Fifth, those who are likely to benefit from the notified measure are not the leasing companies, but the lessees, that is those undertakings who pay the regular instalments required by that type of contract. Yet, as stated in paragraph 28 above, the Commission considered that the lessee could in principle be any undertaking of any size active in any sector of the economy. The Commission’s examination did not therefore have to concern leasing companies or the undertakings which the applicant classifies as ‘intermediaries’ with no further specification. 98 Sixth, as regards the applicant’s argument that the Commission ought to have defined a reference system allowing for the assessment of the advantage granted, it must be observed that the notified measure is a general tax measure, which does not have the effect of creating an advantage for a category of specific undertakings. 99 According to the case-law cited in paragraph 90 above, advantages resulting from a general measure applicable without distinction to all economic operators do not constitute State aid within the meaning of Article 107(1) TFEU. Further, again according to the case-law, a different tax burden resulting from the application of a ‘general’ tax regime is not sufficient on its own to establish the selectivity of taxation for the purposes of Article 107(1) TFEU. The criteria applying to the different tax burden must, in order to be capable of being recognised as conferring selective advantages, be such as to characterise the recipient undertakings, by virtue of properties which are specific to them, as a privileged category, thus permitting such a regime to be described as favouring ‘certain’ undertakings or the production of ‘certain’ goods within the meaning of Article 107(1) TFEU (see, to that effect, the judgment in Commission and Spain v Government of Gibraltar and United Kingdom, EU:C:2011:732, paragraphs 103, 104 and 107). 100 That does not apply to the notified measure. In these circumstances, there was no need for the Commission to define a reference framework in order to analyse the effect of the notified measure. 101 Seventh, the scope of the examination which the Commission must carry out under Article 108(3) TFEU depends on the content and effects of the notified measure and not on articles published in the press about the notification or about measures examined in different procedures. 102 The applicant’s third argument is that, since the Commission considered, correctly, that the notified measure was limited to assets which satisfied certain criteria, which gives rise to a degree of selectivity, the Commission’s explanation in paragraphs 31 and 32 of the contested decision, that any selectivity is an inherent part of the general tax system and justified by the logic of that system, is insufficient and incomplete. 103 According to the applicant, the explanation given in the contested decision, that the early depreciation provided for by the notified measure was justified by the very substantial cost of pre-financing required for the construction of the asset, is contrary to the Commission’s previous decisions and to the Commission notice on the application of the State aid rules to measures relating to direct business taxation (OJ 1998 C 384, p. 3), and in particular paragraph 23 of that notice which provides that the differential nature of some tax measures may be justified if their economic rationale makes them necessary to the functioning and effectiveness of the tax system. Further, according to the criteria established by the Commission in its Decision 96/369/EC of 13 March 1996 concerning fiscal aid given to German airlines in the form of a depreciation facility (OJ 1996 L 146, p. 42), the differential nature of a tax measure might be justified if the measure did not apply solely to specific sectors, was based on objective and horizontal criteria or conditions and was not limited in time. According to the applicant, the notified measure does not satisfy those criteria. 104 The applicant claims, first, that, even though the measure is not explicitly directed to assets in specific sectors, the measure is applicable only to a very reduced number of assets, taking into consideration the fact that the period of construction of these assets must exceed 12 months. Second, as regards the objective and horizontal conditions of the measure, the Commission failed to explain in the contested decision why the advantage of early depreciation could apply only to assets financed by leasing contracts and not to assets financed by other means. Last, according to the applicant, the Commission appears not to have taken into consideration in the contested decision the third criterion, namely whether the notified measure was or was not limited in time. 105 Further, the applicant claims that the contested decision did not examine how the selective derogation from taxation principles was justified by objective differences between taxpayers, contrary to the Commission Decision 2011/282/EU of 12 January 2011 on tax amortisation of financial goodwill for foreign shareholding acquisitions (C 45/07 (ex NN51, ex CP9/07)) implemented by Spain (OJ 2011 L 135, p. 1). According to that decision, only after an assessment of whether and in what way the notified measure derogates from the general tax system can the Commission analyse whether such derogation is consistent with the internal logic of that system. In this case, the Commission failed to follow that approach. The Commission undertook no comparison of, on the one hand, the undertakings which can benefit from the notified measure and, on the other, those which do not benefit from it. Last, the applicant observes that the Commission has not explained why it chose to depart from the approach in its previous decisions. 106 The Commission, supported by the Kingdom of Spain, argues that the applicant’s third argument is unfounded. 107 It must be observed that, according to paragraph 31 of the contested decision, the conditions imposed by the notified measure restrict the possibility of early depreciation to certain assets. The Commission considered however that those restrictions were justified by factors relating to the period of construction of a custom-built asset and the need to meet pre-financing costs during that period. 108 That explanation can readily be understood, particularly if the notified measure is compared to Article 115(6) of the LIS concerning accelerated depreciation. The new version of Article 115(11) of the LIS derogates from that provision only to the extent that it allows the possibility of altering the date from which that accelerated depreciation is to occur. Article 115(6) of the LIS allows the accelerated depreciation of assets financed by a leasing contract only from the date on which the asset is actually available. However, given that, as regards custom-built assets which are the subject of the new version of Article 115(11) of the LIS, the greater part of the payment has already been made before that date, it is coherent to bring the date of depreciation into line with that of the payments to the leasing company. 109 Contrary to what is claimed by the applicant, the principles established by the Commission in paragraph 23 of the notice referred to in paragraph 103 above do not preclude that explanation. On the contrary, that notice allows differentiation within a tax system, provided that it is supported by a rational justification. 110 Further, the Commission was not obliged to follow the analytical approaches which it had used in its decisions on depreciation in Germany and on depreciation in Spain of financial goodwill, referred to above in paragraphs 103 and 105 respectively, contrary to what is argued by the applicant. Each case must be assessed separately according to the particular circumstances of the case (judgment of 1 July 2009 in KG Holding and Others v Commission, T‑81/07 to T‑83/07, ECR, EU:T:2009:237, paragraph 201). 111 Last, as regards the applicant’s argument that the restriction of early depreciation to assets financed through leasing contracts is not objectively justified, it is clear that Article 115 of the LIS governs only leasing contracts. Consequently, the notified measure could concern only leasing contracts and not other forms of financing. 112 The applicant’s fourth argument is that the Commission should have examined the question of whether the notified measure was compatible with the rules of the internal market. That is, it is claimed, additional evidence that the contested decision is insufficient and incomplete. According to the applicant, decisions on State aid cannot give rise to situations which are contrary to internal market rules. If the advantage conferred by the notified measure were to be limited to Spanish banks or to other intermediaries or shipyards in Spain, that would constitute an infringement of the rules on the free movement of goods and the freedom to provide services, which would have to be justified by the Kingdom of Spain in accordance with the case-law of the Court of Justice. 113 The Commission, supported by the Kingdom of Spain, contends that the applicant’s fourth argument is unfounded. 114 It must be recalled that the compatibility of a measure with the internal market must be considered where it is established that the measure at issue constitutes State aid. In this case, the Commission took the view, for the reasons set out in paragraphs 26 to 36 of the contested decision that the new version of Article 115(11) of the LIS did not constitute State aid. That being the case, there was no need for the Commission to carry out an analysis of the notified measure’s compatibility with the internal market. 115 It follows from the foregoing that the arguments relied on by the applicant fail to establish that the examination of the notified measure by the Commission was insufficient and incomplete. 116 It also follows that the applicant has not demonstrated that serious difficulties were encountered by the Commission in its preliminary examination of the notified measure. The single plea in law relied on in support of the action must therefore be rejected as being unfounded. 117 Consequently, the application for annulment of the contested decision must be dismissed without, in the interests of procedural economy, there being any need for a preliminary ruling on the admissibility of the action (the judgments of 26 February 2002 in Council v Boehringer, C‑23/00 P, ECR, EU:C:2002:118, paragraphs 51 and 52, and of 15 June 2005 in Regione autonoma della Sardegna v Commission, T‑171/02, ECR, EU:T:2005:219, paragraph 155). 118 Under Article 87(2) of the Rules of Procedure, the unsuccessful party is to be ordered to pay the costs if they have been applied for in the successful party’s pleadings. Since the Commission has applied for costs and the applicant has been unsuccessful, the latter must be ordered to bear its own costs and to pay those incurred by the Commission. 119 Under Article 87(4) of the Rules of Procedure, the Member States which intervened in the procedure are to bear their own costs. Accordingly, the Kingdom of Spain, intervening in support of the Commission, shall bear its own costs. Delivered in open court in Luxembourg on 9 December 2014.